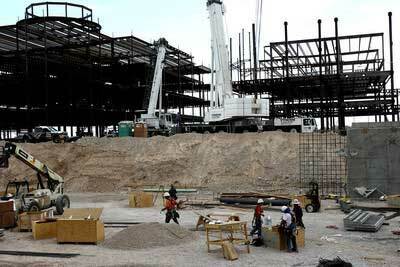 Las Vegas commercial real estate cites bad economy to delay construction progress. News strikes again in the city of delayed or halted developments. The economic slowdown and rising construction costs delayed the $850 million Tivoli Village at Queensridge. Another commercial real estate development is taking the wait and see approach to construction progress including Summerlin Centre, Manhattan West and Echelon Las Vegas. They say continued construction will be at a slower pace. Tivoli Village was scheduled to open third quarter of 2009, but now sometime in 2010. The development architectural plans include 340 condos, and 700,000 square feet of office, restaurant and retail space. The real estate partners are not new to delayed construction progress. Joint venture partners IDB Development and Executive Home Builders are also connected to the postponed Plaza resort on the Las Vegas Strip. The partnership did complete the $250 million One Queensridge Place luxury condos last year. There is a mixed sense of urgency with tenants in the current economy, some wanted to move in later and others wanted to open their retail locations sooner. Tenants at Tivoli Village are Ritual Salon and Spa, Tommy Bahama, AG Jeans, Grand Lux Café and David Barton Gym. The commercial real estate, originally named Village at Queensridge, has gone through several design changes and increased construction cost drove the price from $500 million in May 2005 to $850 million. Las Vegas commercial real estate cites bad economy to delay construction.